Ryan Garton (left) and Alex Hudak (right) are getting ready for the postseason at Florida Atlantic. Photos courtesy Florida Atlantic University. As noted in last week’s round up, some teams are already done with their regular seasons. That makes this a pretty shallow week around college baseball. That being said, the few Big Train players that were still playing last week did very well. Most of those players played at two Big Train outposts. The first of those was Florida Atlantic where Ryan Garton (BT ’11) had a great start that led to his ninth win of the season. Garton went seven innings and gave up only one earned run on five hits a walk while striking out two in a 12-2 beat down of Florida International last Thursday. Bo Logan (BT ’12) picked up the other win in the two-game set out of the bullpen the next day as he went three innings while giving up only a walk and striking out four. As for the other Big Train players for the Owls, Alex Hudak (BT ’11) had a very loud 2/8 (2BB, 2R, 4RBI, HR, 2B) and Mitch Morales (BT ’12) went 3/9 over the two games. The second collection of Big Train talent was busy at UNC-Wilmington for a four-game week. The Seahawks won the first three games thanks to the superb pitching of two Big Train players. 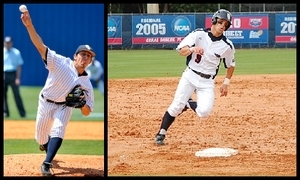 Ricky Holden (BT ’12) and Kelly Secrest (BT ’11-’12) combined for three appearances and two wins over those three games. They combined to pitch nine innings and gave up only one earned run on four hits and three walks while striking out eight. However, you can’t win games just on pitching. Michael Bass (BT ’11-’12) provided support from home plate as he went 6/15 (two doubles) with a walk and scored five times, drove in two more, and stole two bases. One last thing of not this week was a remarkable game by Brennan Middleton (BT ’11-’12) at Tulane. In Tulane’s 3-1 win over Marshall last Thursday, Middleton went 3/4 with two runs scored, a triple, and three steals. Middleton’s base running will definitely be an asset to the Big Train this summer.